Who’s King of the Pasture at Montana’s National Bison Range? ©Bert Gildart: High atop a wind-swept butte in western Montana, Janie and I watched a wildlife spectacle few are ever fortunate enough to see. Below us, late evening sun transformed stalks of summer-dried wheat grass to a soft rose-colored glow. There, two giant bull buffalo backed ponderously away from one another until they stood 20 feet apart. The mammoth beasts pawed angrily at the parched grass, kicking dust high into the air, roaring like lions. BISON IN RUT: Muscles tensed; then the animals bore down on one another crashing with such momentum that the sound of their impact carried far above the gusting wind of the sprawling plains. Again and again they repeated the ritual, colliding like locomotives until it appeared their skulls would shatter. For 15 to 20 minutes, the brutal punishment continued. Finally, just as the sun dipped toward a distant range of peaks, one combatant turned groggily and staggered off. With eyes a-glare, the other turned—defiant, angry—searching for yet another challenger. Clearly, this huge bull was king of the pasture—at least that is until recently. Sadly, two other groups are vying to determine who will assume that highly contentious role, and they’re battling as vigorously as the two bison bulls. Specifically, these two antagonists are the U.S. Fish & Wildlife Service and the Confederated Salish and Kootenai Tribe. HERDING BISON: Nevertheless, the CSKT gained inroads, and for about two years it appeared as though a cooperative effort might be achieved. 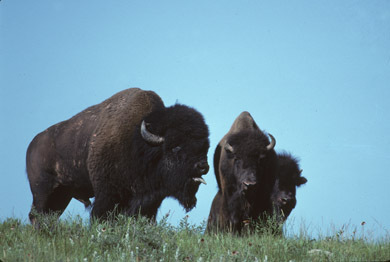 The USFWS would maintain management, while the tribe would perform maintenance. Unfortunately, that didn’t work at all, and recently at the height of the disagreement, allegedly members of the CSKT physically and verbally attacked National Bison Range Project Leader Steve Kallin. Obviously those actions detract from the tribe’s other achievements as successful business managers, and when working alone, they’ve managed to successfully oversee Mission Valley Power. As well, the tribe has established water quality standards on Flathead Lake that are the envy of the nation. Perhaps that’s the problem. Perhaps on a tribal basis they have difficulty assuming a subordinate role, a role that I, too, have always hated. Nevertheless, the upshot is that those of us who find satisfaction in visiting this national wildlife preserve are the losers. 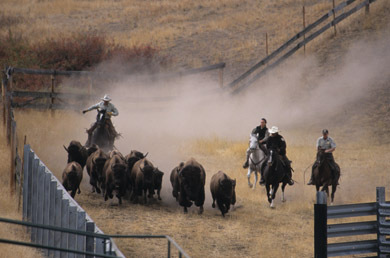 What’s now happening is the bison herd is being reduced through roundups much like those conducted in the fall. Some of the bison will be shipped to other national herds, and this, the tribe says, didn’t have to happen. They say they could have successfully managed a larger herd. Fish and Wildlife Service managers counter saying recent involvement resulted in abuse to the animals and that most involved received poor job-performance ratings. 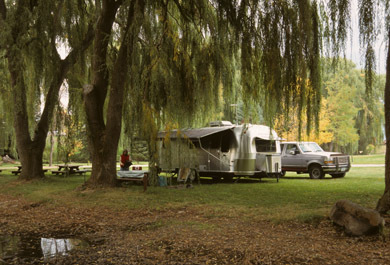 AIRSTREAM: On average Janie and I pull our Airstream to a campground near the refuge several times each year. From it, we drive the 20-plus mile dirt road and in spring see all sorts of wildlife to include antelope, blue grouse, bighorn sheep, owls, and, of course, bison. In summer we drive the refuge to look for deer and around late July for bull bison, which are staking out their territory. Battles are furious; one of nature’s most dramatic spectacles. It can be a wonderful tour, one everyone passing through western Montana should not pass up. And like us, when management proceeds properly, you probably don’t care too much about who is king of the pasture. But when there’s mismanagement, the resource suffers, and suddenly we realize that there’s not a great deal left of our natural world. And then we understand that we simply can’t afford to take chances. And then we realize that we want only professionals managing this very refuge that was responsible for helping to save bison from extinction in the early 1900s. In short, we certainly don’t care about a person’s ethnicity, but we most certainly do care about the individual’s over all professionalism. In the meantime, there’s little that will prevent Janie and me from making our annual trips to the National Bison Range. We’ll want to watch the various bison attempt to establish themselves as King of the Pasture, for there simply are not too many places left in America where such drama unfolds. If you have a chance, we guarantee you won’t forget your tour of the National Bison Range. This entry was posted on Monday, April 16th, 2007 at 6:46 pm and is filed under Montana Photography, Natural History/Conservation, View Point. You can follow any responses to this entry through the RSS 2.0 feed. You can leave a response, or trackback from your own site.